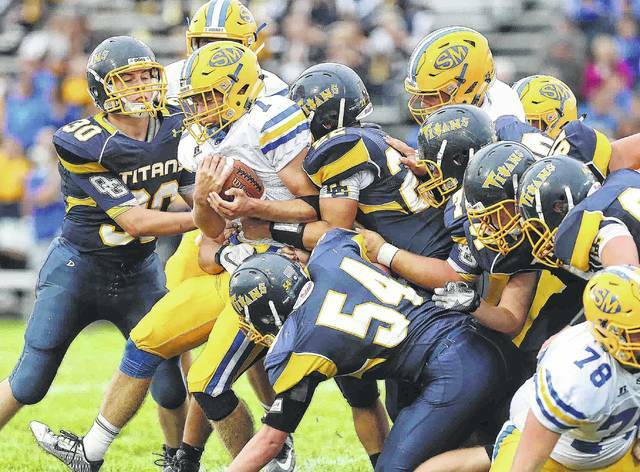 The Ottawa-Glandorf defense returns a number of starters and was one of the bright spots last year for the Titans. RETURNING STARTERS: Will Nichols (OL), Sr.; Logan Clark (OL), Sr.; Logan Hoffman (OL/DL), Sr.; Dylan Tippie (LB/WR), Sr., Ben Duling (LB), Sr.; Danny Rosales (LB), Sr.; Jasper Scarberry (DB), Sr.; Aaron Rieman (OL/LB), Jr.; Eric Heebsh (DB), Jr.; Jarrod Beach (WR), Jr.; Jacob Balbaugh (QB), Soph. PLAYER TO WATCH: Jeremy Leopold. The junior quarterback was slated to start a year ago before a preseason shoulder injury sidelined him for the season. TOP NEWCOMERS: Dwayne Quinn (WR/DB), Sr.; Ryan Heckman (OL/DL), Sr.; Beau Fawcett (LB/WR), Sr.; Nick Buckland (LB/WR), Sr.; Trey Nienberg (WR/DB), Clay Recker (DB/RB), Jr.; Logan Miller (RB/LB), Jr.; Shawn Beverly (WR/DB), Jr.; Preston Rosenberger (OL/DL), Jr.; Jeremy Leopold (QB/DB), Jr.; Logan Schmitz (OL/DL), Jr.; Will Kaufman (WR/LB), Soph. ; Murray Niese (RB/DB), Soph. Aug. 24 Eastwood 7 p.m.
Aug. 31 at St Marys 7 p.m.
Sept. 7 at Bath 7 p.m.
Sept. 14 Van Wert 7 p.m.
Sept. 21 Celina 7 p.m.
Sept. 28 at Shawnee 7 p.m.
Oct. 5 Defiance 7 p.m.
Oct. 12 Kenton 7 p.m.
Oct. 19 at Wapakoneta 7 p.m.
Oct. 26 Elida 7 p.m.
OTTAWA — Ken Schriner turned around to show just how serious Ottawa-Glandorf is about a turnaround from last season’s 3-7 record. Those two words are the theme for this season for the Titans, who had put together 22 winning seasons in the 24 years before last year and made 13 trips to the playoffs in the 20 years before last year. “My goal and our goal for the season is prove it. Prove that what we did last year wasn’t normal for us. Go out and prove this year that you are a competitor and you can go out and compete for the league and hopefully the playoffs. That’s our goal,” Schriner said. “I think our kids approached the off-season that way and we’ve got a good attitude,” he said. Last season got off to an ominous start when second-team All-Ohio quarterback Jay Kaufman suffered a season-ending knee injury in the spring and his projected replacement, Jeremy Leopold, also went down for the year with a torn labrum in his throwing shoulder in the Titans’ second scrimmage. Freshman Jacob Balbaugh, who was expected to be the No. 4 quarterback on the roster, became the starter. “When you take a guy who played eighth grade football the year before and throw him into the mix in the Western Buckeye League that was a little bit of a challenge. But he accepted it. He was a tough kid and did what we asked him to do. But it just kind of limited what we wanted to do,” Schriner said. Leopold says he’s ready to step into the role he expected to play last season after Kaufman’s injury. Balbaugh will be Leopold’s back-up this season. Ottawa-Glandorf has returning starters at 14 positions – seven on offense, seven on defense. Much of that experience is on the offensive line and at linebacker. Will Nichols, Logan Clark, Logan Hoffman and Aaron Rieman all started on the offensive line in 2017 and Dylan Tippie, Ben Duling, Danny Rosales and Rieman were starters at linebacker. Defense was a strong point for the Titans last season and could be again this year. The offense ranked eighth in the Western Buckeye League in scoring and total offense and the defense was fourth in the league in points allowed and total defense. “We played a lot of guys. We’ve got a lot of guys back and not necessarily starters. Our starter list (on defense) could be about 17 deep. We rotate guys in and part of that is we play a lot of guys two ways. Probably around six are going to play both ways at least part time and it might even be more than that,” Schriner said. Offensively, O-G needs to replace its No. 1 running back, Daniel Beemer, who was the WBL’s regular-season rushing leader with 1,214 yards, and its top receiver, Richie Knowlton, who had 41 catches. The Titans will open the season at home against Eastwood, last year’s Division V state runner-up, on Friday night. This entry was tagged hsfootball, ottawaglandorf. Bookmark the permalink.